From the early days of advertising and marketing to the present day, no tool has been as powerful as digital marketing. With new age analytical techniques and terrabytes of data available about consumer behavior, it has become exponentially effective in reaching the right target audience at a fraction of cost of conventional advertising. Today, digital marketing is no longer an advantage. It is a necessity. O Digital is a digital marketing agency that was founded on this exact belief. By deploying cutting-edge technology and latest tools, we will take your business to those who are looking for precisely what you offer. They will not think twice before opening their wallets. Whether you looking to improve the performance of your existing site or you need a comprehensive SEO strategy for your upcoming site, O Digital can be your one-stop shop for all your SEO requirements. Our world-class client servicing helps you to stay on top of your digital marketing game at every step of your way to success. Our courteous and knowledgeable personnel will be eager to answer your queries … 24/7. When you hire O Digital, you are putting to use a wealth of expertise and rich knowledge of our proficient team. Each member of our team is uniquely qualified to contribute to your overall success. No two businesses will have the same digital marketing requirements. At O Digital, we understand this all too well, and therefore our services are fully customized to suit your exact needs. O Digital is a Philadelphia based digital marketing agency with over 10 years of experience in a variety of digital marketing avenues. Ourextensive client base includes a wide range of industry verticals mostly from small and medium enterprises. Therefore, we primarily focus on local SEO that enables your business to attact customers from your area. We have partnered with some of the biggest names in the industry such as Google, Magento, and Big Commerce -to name a few – so you get the very best of digital marketing and related services. Search engine optimization is not just about reaching the top of a search engine results page. A huge chunk of our client base comprises of small and medium businesses like yourselves. Take a moment to hear what our satisfied clients have to say about our services. Steve Nelson, Customer Packaged Goods. SignCafe, Signage Writers in Melbourne. Urban Oak, Engineered Flooring Solutions, Australia. We provided extensive site audits and continuously monitored all the paid and organic search traffic of our new client. This helped us to draft a strategy to target the customer pain points, choose the best keywords and then run the campaign to quickly make our client popular among users. In as little as 15 days we were able to successfully get our client to the first Google search results page. Grew to $200,000 / month in organic revenue in 2 years! Coalition provided Search Engine Optimization (SEO) and Pay Per Click (PPC), including exhaustive site audits, ongoing technical work, link building, PR and more during the course of our campaign with this women's swimwear retailer. Our team's efforts helped to grow the brand from an average of $4,000 a month in sales to over $200,000 in organic revenue within a two year time period. $32,500 in marketing spend generates $800,000 in revenue. The Pink Lily Boutique approached Coalition as the brand eyed its future. The husband and wife team behind the successful fashion startup were eager to find a forward thinking and stable digital agency they could rely on for SEO, PPC, BigCommerce design and development, and more. Led by the Coalition Digital Strategy team, Pink Lily's trust was rewarded with fantastic growth in revenue generated through organic traffic, PPC advertising, and social, as well as improved conversion rates with a conversion optimized BigCommerce store. 400% growth in revenue in 9 months with Coalition. Most businesses take years to experience the type of growth Coalition was able to generate got Trophy Outlet - a 400% revenue growth in nine months working with us. 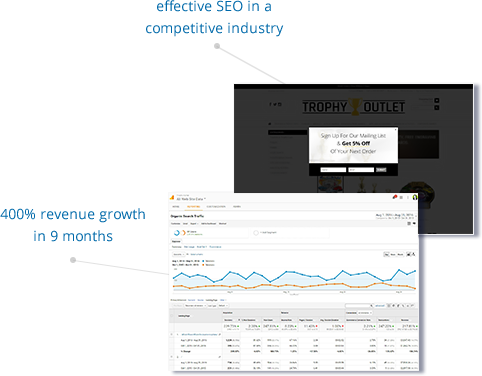 By leveraging the incredible marketing power of search engine optimization (SEO) in a highly competitive industry, TrophyOutlet.com's work with Coalition has generated an incredible ROI. SEO drives doubling of organic sales and traffic. After another agency poorly migrated them to a BigCommerce store, 1ink.com faced a huge range of SEO issues that were contributing to lost rankings and revenues. Coalition's SEO and strategy teams spotted numerous duplicate content issues, internal linking problems, and more early in the campaign and were able to resolve them effectively. Our SEO work increased organic search revenue by nearly 100% in a matter of months from kickoff. 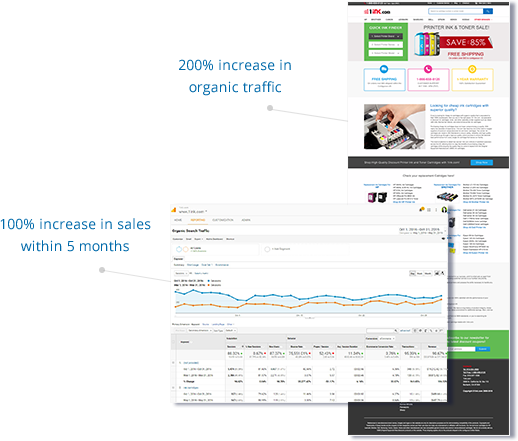 We are highly respected in USA as leaders in web design, SEO, and PPC. Top software companies and other digital agencies will directly refer clients to us or subcontract our team to handle projects as they know we do the best work at reasonable pricing. "Our partners go to extra lengths to attain the certified status, including passing our exams, which demonstrates their in-depth knowledge of AdWords." "Coalition Technologies is a firm that we are proud to have worked with, and we know they do consistently great work." "Open source platforms are only as good as their developers, and Coalition's knowledge of Magento is impressive and a valuable resource for their clients." "As one of the fastest growing eCommerce carts on the web today, we have the chance to work with a lot of companies. But Coalition stands out as one of our elite web design partners." "Not many design companies are capable of handling Volusion's powerful software and features, but Coalition's ability to creatively reinvent the ecommerce platform stands out among the companies we've worked with." "As a startup in an extremely competitive marketplace, its important for 3dcart to work with highly capable designers and developers who will enhance its reputation. The team at Coalition Tech sets an extremely high bar for others to aspire to."